DPReviews has given the Sony a7III a glowing review and no one should be surprised. 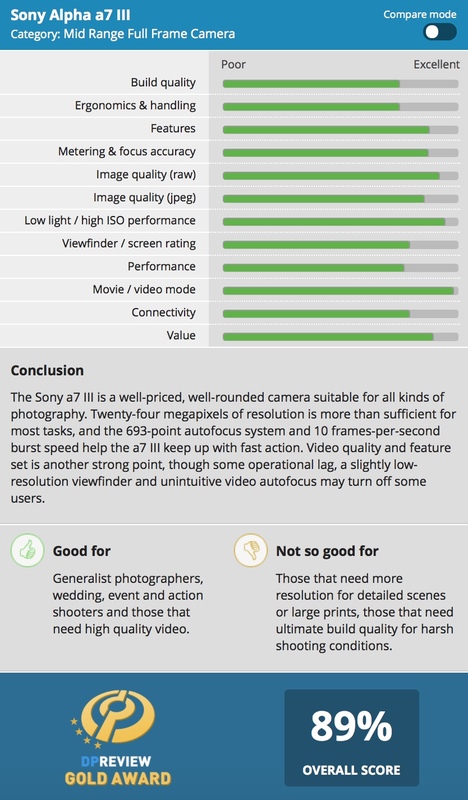 The a7III offers an incredible value for those looking to purchase a full frame camera and you can read the full review here or just check out the summary below. Put simply, the Sony a7 III is a new benchmark for full frame cameras due to its compelling combination of value and capability – and the fact that this series of cameras has come so far in less than five years is impressive in its own right. For around the same price as an ‘entry-level’ full frame camera in 2012 and 2013, the a7 III offers speed for the sports shooter, autofocus accuracy for the portraitist, dynamic range for the landscape photographer and low light image quality for the couple at a candlelit dinner. And don’t forget about the best video quality and feature set this side of a dedicated cinema rig.